Domestic Sugar: Because Domestic Life is SWEET! : Something Evil this way Comes! Because of the influx of emails asking me which recipe I used to make these cookies, I am posting a like to my sugar Cookie Recipe HERE! Tomorrow for school, I get my first crack at dress-up; the kindergarten kids who only come on Tuesdays and Thursdays are having their party. I guess I need to get a makeup-check before the big day! The ghoulies are already stealing my cookies. No, that is not my hand all yuckie with dirt. 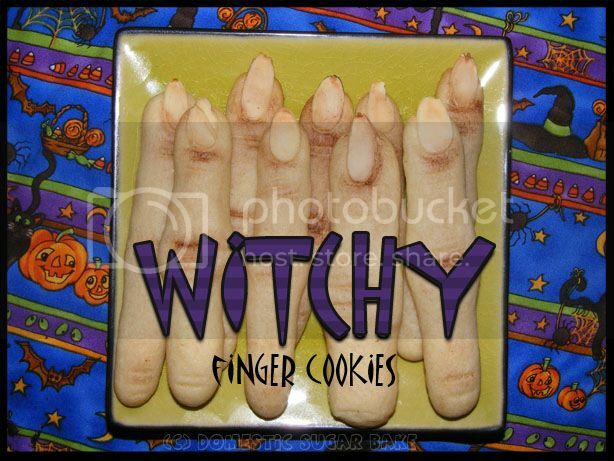 I've always loved the way these simple cookies make Halloween tables look. Honestly, all lined up, or piled into a jar, they look absolutely creepy! That is why I was so excited to make them! They are the simplest cookie too. Simply roll out some sugar-cookie dough into a thin line (and hes, mine are a little thick, make your cookies thin because they spread), apply an almond shard, score the knuckles, then bake as directed. 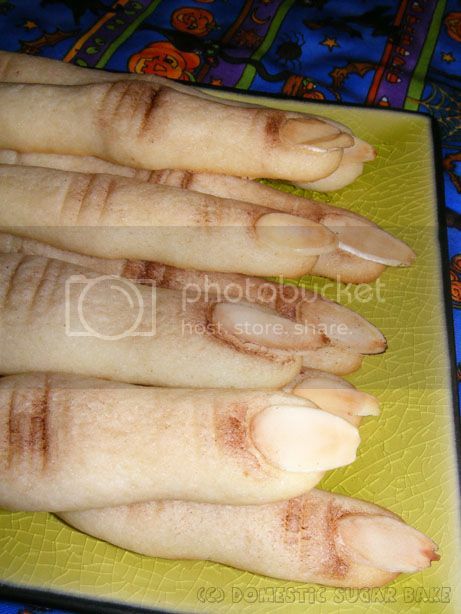 I like to brush mine with a little cocoa-powder after baking (with a paint brush) to make the hands look dirty and contrast-like. Honestly, this is a no-fail treat (unless there are allergies involved). I've got a super awesome treat lined up for Halloween, and it's time to start the pre-baking. It will be awesome. I can't wait! A lot of people have asked 'how did I do this.' The directions are true, and should be right, but if you have certain problems, look below. I will try to add answers as they are asked. My cookies are flatter than yours: My answer to you is to be cautious of your butter to flour ratio. Oftentimes, doughs react differently at different humidities or temperatures. If you find your dough spreads a little too much, try adding a little flour to the mix before you put in the next batch. I always do a 'test batch' when baking cookies, so I know how they are going to spread. How thin and long should I roll the dough: As for the thinness of the dough.. I rolled the dough to 3/4 of the width my own fingers, about a bit longer than a real finger. The cookies should spread but stay plump. The bottoms WILL be flat, but the edges are rounded. Michelle Junker adds: I used store bought cookie dough today, knowing I had to add flour, I ended up adding 3/4-1 C. of flour and they turned out perfect. Made them extra thin and then made boney knuckles. I also used whole almonds that I cut in half. Very happy with the results! Thanks! Oooohhhh...so creepy! These fingers definitely bring the evil to the party. Cool! I was going to say the exact same thing as Heather, these are so realistic and so so creepy. These are sooooooo amazing! You are totally talented! Wow! Those are the creepest fingers I've EVER seen! Would you come over to CAST PARTY WEDNESDAY and share this with us? Those are so awesome. I love the cocoa powder trick, that really makes them more realistic! ok these looks so real! best I have seen on the internet that is for sure. Oh My Gosh! Those look soooo REAL! I saw you on Sweets on Sunday. Please share on Thursday's Treasures.<3 and HUgs! hahaha they are really cool and creepy at the same time! Umm, this is awesome! These look so real! It's gross, but they look delicious! I'll have to try these!! Your cookies look very REAL! How do you do the knuckles? With a toothpick? And do you brush on the cocoa powder when you get them out of the oven? How do you do the almond part? This is so awesome! Thanks for posting! I've seen a lot of versions of these on All Recipes but, I must say, yours are the most realistic I've ever seen!!! I don't know if I could bring myself to eat one, they look so authentic! oh wow are these creepy!!! what a great job!! Those are some wicked cookies! Great job with your creativity. Yours look amazing. How did you dust the cocoa powder?. My cocoa looked awful. Trying these now (crossing fingers) they look awesome my friends said eww my kids yelled YES PLEASE MOMMY!!! Love my kids! It doesn't say this in recipe, but do you score them for lines on knuckles and do you shape the knuckles a little before baking? I really want to do this, but we not allowed to bring nuts to school because of allergies. Any recommendation on replacement finger nails? They look amazing! Would cinnamon also look good in the knuckles? I'm looking for a cinnamon lover's cookie. I tried these with store bought dough. They went COMPLETELY flat. I was so sad. I'm afraid if I add more flour, they wont taste as good? OMG!!! This is the CREEPIEST food I have ever seen. They look so authentic that even thinking of taking a bite is making me feel sick. What is your sugar cookie recipe? I would to love to bake these for the block party we have. 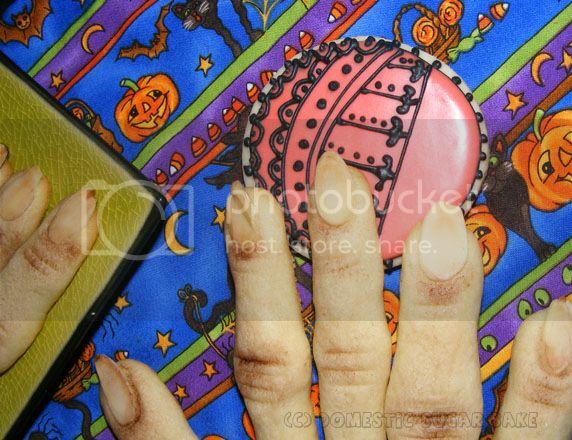 I saw your totally gross, creepy and awesome cookies at the Mom on Timeout Link Party...these are so awesome! Pinned! Thanks for the great Halloween cookie share! I used store bought cookie dough today, knowing I had to add flour, I ended up adding 3/4-1 C. of flour and they turned out perfect. MAde them extra thin and then made boney knuckles. I also used whole almonds that I cust in half. Very happy with the results! Thanks! I made these today using your dough recipe and they turned out perfectly! Thanks! "I used store bought cookie dough today, knowing I had to add flour, I ended up adding 3/4-1 C. of flour and they turned out perfect." I just wanted to say that I went by this measurement and my batch came out amazing. One roll of cookie dough and 3/4 cup of flour is the perfect ratio. Also the difference between cinnamon and cocoa powder. I tried both.. the cinnamon just didn't dust on right, it was all grainy and blotchy compared to the cocoa powder which applied amazingly smooth, almost like an airbrush effect. Thanks for this. I used it to great effect this Halloween (picture). I also added in slightly more than 3/4 of a cup of flour into store-bought dough, and it came out great. One tip I wanted to share: Wait until the cookies have cooled quite a bit before you brush them with cocoa powder. If you do it too early, it kind of clumps instead. Also, my "fingernails" came off pretty easily if you bumped the jar they were in. I ended up making a thick paste of some powdered sugar and water, and used a tiny drop to "glue" the fingernails back on for a few of them. Worked great. What is the sugar cookie recipe for this so I can make some this year. Just made these myself using your sugar cookie recipe you give the link for at the top of the page. They turned out spectacular. I did have to cook them longer than the suggested time but otherwise one of the best ideas/recipes ever. Thank you VERY much! Just made them right now with the tip of adding more flour. They turned deliciously creepy! Thank you for sharing! Turned out great! Lots of grossed out people. I added red food coloring to the ends for a bloody look and painted red "nail polish" for some (used a little paint brush for the cinnamon and food coloring. Last year I made mine light green. then dipped the ends into cherry preserves. Seriously these are the best I've ever seen. I just made these, they turned out really good! I'm so excited to see what everybody thinks tomorrow! Thanks for sharing! Awesome recipe and directions! Made these for the first time this year using store bought dough and added ~3/4 cup of extra flour to keep them from spreading. Dough was a little dry but had to do it to keep them from flattening out. Worked perfect! Also added some "blood" to the nub end by melting some cake frosting with red food coloring to the desired color, dipped them and let the frosting drip down toward the nail to get that blood drip effect then let them cool til it was time to eat. They were a big hit!!! Thank you so much for sharing how you made these fingers! My 6 year old daughter and I made some for school to hand out to her classmates and teachers following your instructions. Both children and teachers loved it: you helped us liven-up a very dull town in France. Your biscuits will be remebered as "des petits doigts de sorcière". Thank you very very much it really was tremendous fun. Um.. where are people finding this recipe? The link goes to a totally different recipe. I've searched the blog and there is nothing. I think I made mine too big, they took forever to cook and flattened out. I even added the flour as mentioned in others messages. Bummers!